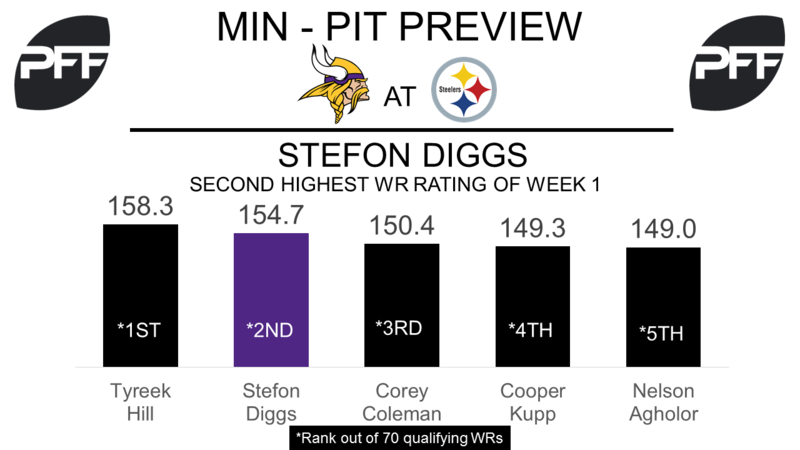 WR Stefon Diggs vs. CB Joe Haden – Diggs dominated Week 1, leading all receivers with an overall grade of 89.0. Diggs also led all receivers with 68 receiving yards coming on deep passes (a pass targeted 20 or more yards downfield), and had a receiver rating of 154.7, the second highest from Week 1 (the passer rating generated when targeting this receiver). The player who will go head-to-head with Diggs is Joe Haden, who had a less than stellar Week 1. The cornerback was targeted ten times and gave up seven receptions for 109 yards in Week 1. Cleveland Browns QB DeShone Kizer had a passer rating of 105.8 when targeting Haden and his overall PFF grade of 41.6 ranked 79th among 91 qualifying corners. T Riley Reiff vs. EDGE T.J. Watt – Another player who had a strong Week 1 for the Vikings was free agent addition Riley Reiff. The offensive tackle was one of nine tackles who had a pass-blocking efficiency (PBE) of 100, not allowing a single pressure on 33 pass blocking snaps (PBE measures pressure allowed per snap, with weighting towards sacks). His overall PFF grade of 84.1 was the sixth best of Week 1. Watt had quite an impressive debut on Sunday, ranking 18th among edge defenders with an overall PFF grade of 78.0. He ranked 19th among edge defenders with a 12.1 pass-rush productivity rating after he tallied four total pressures (two hurries and two sacks) on 29 pass rushing snaps. RB Dalvin Cook vs. LB Ryan Shazier – Another rookie who had a strong debut was Vikings running back Dalvin Cook, the Florida State product earned the second highest game grade by a runner in Week 1 with an overall PFF grade of 83.8. He had a breakaway percentage of 51.2 (the percentage of rushing yards which came on runs of 15 or more yards) also the second highest by a running back in Week 1, earning 65 of his 127 rushing yards on runs of 15 or more yards. Linebacker Ryan Shazier will need to improve his performance in run defense if the Steelers are to stop Cook. Shazier had a run defense grade of 44.3 in Week 1, this ranked 49th out of 68 linebackers. He also failed to pick up a stop in run defense on 21 run snaps. G David DeCastro vs. DI Linval Joseph – DeCastro finished Week 1 as the fifth-highest graded guard in the league with an 83.8 overall, and his 86.6 pass blocking grade ranked second-highest. 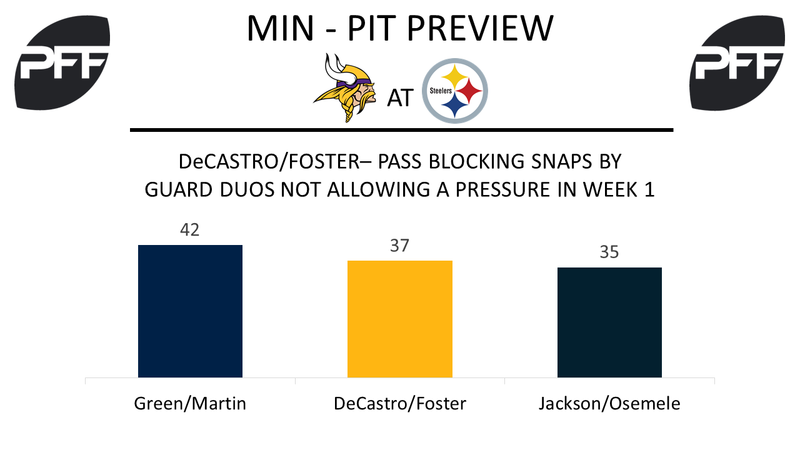 The duo of DeCastro and Ramon Foster did not allow a single pressure to the Cleveland Browns, one of only three duos to do so. But DeCastro’s 78.7 run block grade was the 18th-highest in the league among guards while Joseph earned the third-highest run defense grade among interior defenders with an 88.0. Joseph’s 18.8 percent run stop percentage is tied for third-best for a defensive tackle, as he helped the Vikings defense hold the New Orleans Saints backfield to 29 rushing yards after contact. He’ll look to do the same to the Steelers potent offense. WR Martavis Bryant vs. CB Trae Waynes – While Antonio Brown reeled in 11 of 11 targets for 182 receiving yards against the Cleveland Browns, Bryant had a passer rating of 2.8 when being targeted. Bryant also was unable to bring in either of his two deep targets. His 43.5 overall grade in Week 1 ranked 73 out of 83 qualifying wide receivers. Waynes may be able to help Bryant get back on track, as he allowed a passer rating of 153.1 when in coverage in Week 1. The former Michigan State Spartan’s 2.57 yards per cover snap allowed were the sixth-most allowed by a cornerback with at least 15 coverage snaps in the first week of the season. HB Le’Veon Bell vs. LB Eric Kendricks – In a less than stellar performance, Bell failed to force a missed tackle while rushing in a regular season game for the first time since Week 5 of 2016. Bell’s 0.71 yards per route run were nearly a yard less than his 2016 season. Kendricks began the season with a bang as he earned an 85.0 overall grade in Week 1, the third-highest linebacker grade in the league. He recorded two defensive stops in the run game in 21 run snaps while not missing a tackle. The young linebacker has improved his grade every year since entering the league in 2015 but he has yet to face Bell in his career.